C. Rawlinson, a young Englishman in the military service of the East India company, had been sent to Persia in 1833. In 1835 he was stationed at Kermanshah, and there commenced the study of the inscriptions. He knew nothing of what had been done in Europe, not even of the labors of Grotefend. He commenced with inscriptions found at Mount Elvend, near Ha-madan, a city N. E. of Kermanshah. The following year, when in Teheran, he became acquainted with Grotefend's paper; but he had already proceeded further than the German scholar. In 1837 he copied the first column of the great Behistun inscription, and four of the smaller inscriptions. On Jan. 1, 1838, he sent to the royal Asiatic society an account of his labors. In this year he first became acquainted with Burnouf 's works. He continued his study of the inscriptions till 1839, and had already deciphered and interpreted with a great degree of accuracy the whole of the Behistun inscription, when the breaking out of the war in Afghanistan rendered necessary his transfer to that country, and several years elapsed before he could resume his investigations. He returned to Persia in 1844, and was finally able to present to the royal Asiatic society complete copies of the Persian portion of the Behistun inscription, of which the society published facsimiles in September, 1846. These contained more of the cuneiform writing of the first kind than all the other inscriptions then known in Europe put together. Near the city of Kermanshah, toward the east, the mountain Behistun rises suddenly and precipitously from the surrounding plain to a height of about 1,700 ft. The great inscription is cut upon the rock at a height of 300 ft. from the base. The face of the rock was first cut smooth, and wherever. a fault made it necessary, a stone was set in and fastened with molten lead so accurately that even at the present day it can hardly be detected. Highest on the rock is a figure intended to represent the Persian god Auramaz-da. Underneath this are several other figures. First on the left are armed attendants. Then comes Darius the king, standing with one hand uplifted and one foot upon the breast of a man lying prostrate on his back. Approaching Darius are nine other figures in line, connected by a cord passing around their necks, and with their hands bound behind their backs; these figures, as we learn from the inscription, represent the rebels who at various times and places had proclaimed themselves kings, and had been subdued by Darius. Above the figure of Darius is an inscription which begins, "I am Darius the great king, the king of kings, king in Persia, king of the provinces, son of Vistacpa, grandson of Arsama the Achsemenian." The inscription then gives his genealogy, and closes: " Eight of my family were kings before; I am the ninth. For a very long time have we been kings." Under the prostrate figure is inscribed: "This Gaumata the Magus lied. Thus said he: I am Bardiya, the son of Cyrus; I am king." On the third figure, and extending over on the rock, is inscribed: "This Fravartis lied; thus said he: I am Kshathrita of the family of Uvakshatara; I am king in Media." Over each of the other figures is a similar inscription, the name of each being given, and each being accused of lying in pretending to be a king in provinces in which he had rebelled. Under this group of sculpture the great Persian inscription is cut. The wedges of which the writing is composed are a little more than an inch in length, and for beauty and correctness of execution it stands unrivalled. After being cut it was covered with a kind of hard silicious glazing, which in some places has peeled off and fallen down. Pieces of it are still found on the rocks below. The inscription is in five parallel columns, but the fifth is only about half as long as the other four. The first column is almost entirely preserved. A stream of water flowing from above has rendered illegible the central part of the second column, but by comparison with the other parts of the inscription, and the Scythian and Assyrian translations which accompany it, the missing portions have been satisfactorily restored. The third column is almost perfectly preserved. The fourth has been injured in the same way as the second, but more extensively, and cannot be so satisfactorily restored. The fifth column is almost entirely destroyed, and when Rawlin-son last visited it he found that the rock had suffered so much since his previous visit that it was no longer possible to reach it with the ladders. The copy of the inscription was made by Rawlinson, with the aid of two skilful Kurdish climbers, at considerable personal risk. The lower part has been injured by the elements and probably by the Mohammedans, who when they overran Persia destroyed all the inscriptions which fell in their way; but the inaccessibility of the place where this one was situated preserved it in a great measure from their fanatical zeal. The inscription printed in Roman letters of the size here used would fill about eight columns of this Cyclopedia; and including the Scythian and Assyrian translations (the former in five, the latter in four columns), and the smaller inscriptions, there would be about a dozen pages. Considering that, on an average, there are about four wedges for every letter, one can form some idea of the immense labor expended. The inscription was most probably made a little before the year 500 B. C. It commences in a manner similar to the inscription over the figure of Darius mentioned above, and enumerates the 23 countries over which, through the grace of Auramazda, Darius had succeeded in establishing his sway. The greater part of the inscription is then occupied with an account of his wars against the various persons represented in the sculpture who had rebelled against him, and of their subjugation and punishment. The latter part of the inscription is occupied with praises and thanks to Auramazda, and invocations of his blessings upon all those who should preserve and make known this record, and of his wrath upon all who should destroy or conceal it. Throughout the inscription he constantly ascribes each one of his victories to the grace and assistance of Auramazda. Of the other inscriptions found in various places, the most ancient is one of the first Cyrus. It was found at Murghab, which is supposed to be the seat of the ancient Pasargadae, upon an isolated block of marble, and is repeated in several places in the neighborhood. It consists of only four words, "I Cyrus, king, Acha3menide." Of Cambyses, the successor of Cyrus, no inscriptions have been discovered. Of Darius there are several others, the most important being those found in the ruins of Persepolis and the neighboring country. The inscriptions of Xerxes are next in extent and importance. Of the remaining kings of the Acha3menian dynasty we have a few, mostly very short. The most important are one of Artaxerxes Mne-mon, found at Susa, and one of Artaxerxes Ochus, found at Persepolis. This, the last in chronological order, show's that the language of Persia was already becoming corrupted. The facsimile copies of the inscription published by the royal Asiatic society were accompanied by an elaborate paper by Rawlinson, and a complete translation. The subsequent labors of Rawlinson and of other European scholars have brought the interpretation both of this and the other inscriptions to such a degree of completeness that they can now be studied with almost as much facility and satisfaction as Sanskrit or Greek. The language in which they are written belongs to the Iranian branch of the great Indo-European family. It is nearly related to the language of the Zend Avesta and to the Sanskrit, and it was principally by comparison with those two languages that Rawlinson, and after him the other scholars of Europe, succeeded in interpreting it. - We pass now to the other two kinds of writing which, as we have remarked, appear upon almost all the monuments on which the first is found. They are much more complicated than the first, and far more difficult of interpretation. The writing of the second kind, so designated because on the monuments it stands next after the Persian, is undoubtedly older than the latter, and is nearly related to the third kind. It consists of about 100 different characters, some of which are supposed to represent letters, others syllables, and others are perhaps ideographs or pictures. The language is supposed to belong to that family variously designated by philologists as the Tartar-Finnish, Mongolian, Turanian, and Scythian. In works treating of these inscriptions it is perhaps most frequently called by the last name, and we have so designated it. The greater part of what has been written upon the subject by Rawlinson, Norris, Westergaard, Oppert, and others is scattered in the journals of learned societies, more especially the "Journal of the Royal Asiatic Society of Great Britain," the Memoires de la societe royale des antiquaires du Nord of Copenhagen, the Journal Asiatique of Paris, and the Zeitschrift der deutschen Mor-genlandischen Gesellschaft. The third kind of cuneiform writing presents if possible still more formidable difficulties, while far stronger motives stimulate the endeavor to overcome them. Previous to 1842 the chief specimens of this kind were those on the same monuments on which were found the Persian and Scythian inscriptions; but in that year M. Botta, French consul at Mosul, commenced making excavations in the mounds near that city. Mr. A. H. Layard was then travelling in the East, and made the acquaintance of M. Botta. In 1845 Botta made known his wonderful discoveries, and in October of that year Layard, under the patronage of the British museum, started for Mosul to engage in a friendly rivalry with Botta in exhuming the ruins of Nineveh, the long lost capital of the ancient Assyrian empire. The walls of the palaces he unearthed were covered with cuneiform inscriptions, and immense numbers of clay tablets and cylinders or prisms covered with the same characters were found. Thousands of these were sent to the British museum, of which they now form one of the most important departments; and Mr. Layard's published accounts of his researches excited general attention. In 1849 and 1850 Botta also published in Paris an account of his researches, and the Louvre has a department devoted to Assyrian antiquities almost as extensive as that of the British museum. Some years afterward an expedition was sent out by the French government under the direction of Oppert, an account of which he published in 1859 and 1863. In 1873 Mr. George Smith explored Mesopotamia at the expense of the London "Telegraph," and he is expected to return there during the present year (1874) as the agent of the British museum. Thus a vast mass of inscriptions upon slabs, tablets, bricks, etc, has been collected. To the interpretation of these records a great number of scholars have devoted themselves, among whom Rawlinson, Hincks, Morris, Smith, Talbot, Sayce, Botta, De Saulcy, Oppert, Lenor-mant, Menant, and Schrader have been most distinguished. The success that has attended their efforts warrants the belief that the interpretation of all the records which are of any interest will be finally accomplished. The difficulties which have been overcome will be best appreciated from a statement, necessarily brief, of the results of their labors. From very ancient times three, and perhaps four, different peoples inhabited the Assyrian empire. They differed in origin and language, and were yet in close contact and had intimate political and commercial relations with each other. With which of them splenography originated it is as yet impossible to decide; but it was adopted from one people by another, and variously modified by each. It was originally a system of hieroglyphic or picture writing, and was undoubtedly invented by a people who did not belong to either the Indo-Germanic or Semitic family. Should the interpretation of the Medo-Scythian inscriptions, those of the second class, ever be as fully accomplished as that of the other two kinds, it will undoubtedly throw much light on the origin and history of the writing. The Assyrians in adopting this system modified it to suit their own ideas, but it was not until the times of the Persians that it became an almost purely alphabetic system. In the Assyrian inscriptions the different groups of wedges represent, first, ideas, but having been adopted from a foreign people speaking a different language, the words which originally corresponded to those ideas were entirely different from the Assyrian words representing the same ideas; second, syllables, used in spelling words without any reference to the meaning of the characters as representatives of ideas. Thus a certain group of six wedges is used as an ideograph to denote "father" (Assyrian abu), but when used as a phonograph in spelling other words it represents the syllables at and ad. All the groups used as phonographs represent either vowels or consonants combined with vowels, that is, syllables, never consonants alone. Thus it will be seen that one of the difficulties to be overcome in translating any given passage is to determine whether a group is used as an ideograph or a phonograph. 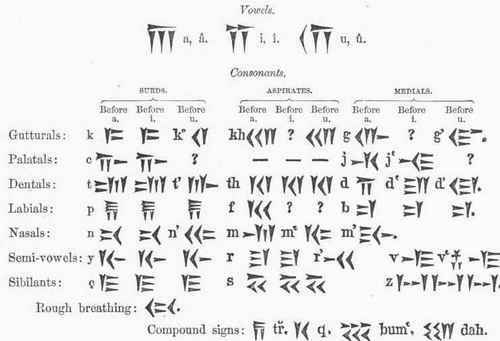 But the greatest difficulty, and the one which for a long time made many learned men suspicious in regard to the trustworthiness of all translations of Assyrian inscriptions, is the fact, now fully established, that the same character as an ideograph often represents several different ideas, and as a phonograph several different syllables. Hence the correct interpretation in any case can be ascertained only by the most patient study and comparison of different inscriptions. For example, one group of three wedges stands in different inscriptions as an ideograph to represent the noun "country" and the verb "to take;" as a phonograph it represents the syllables mat, lat, sat, hur, nat: another group of three wedges differently arranged represents as an ideograph "light," "sun," "day," "sea;" as a phonograph the syllables ut, tarn, par, lah. Fortunately the Assyrians themselves have come to our aid. Among the clay tablets discovered are a large number written in two vertical columns, the first of which contains ideographs, the second their meanings in phonographs. Other tablets are in three columns, the middle one generally containing the ideograph to be explained, the left-hand one its phonetic value, and the right-hand one its meaning in the Assyrian language. The Assyrians endeavored to remedy the ambiguity of their writing in a way of which the following is an example: When the character mentioned above is used to denote the sea (tihamti), a phonograph representing the syllable ti is placed after it; when it stands for the sun (sansi), it is followed by a phonograph denoting the syllable si; and when it denotes the light (nara), it is followed by one denoting the syllable ra. The Assyrian language is Semitic, and exhibits the chief characteristics of that family. Thus it has the emphatic t and s; forms the feminine in t; has conjugations (kal, niphal, iftael, etc.) corresponding to those found in one or another of the other Semitic tongues; and distinguishes the "construct state " of nouns. These are among the most marked characteristics of the Semitic languages. It appears to be more nearly related to the Hebrew than any other. The contents of these records relate to almost everything connected with the history, the religion, the laws, the social life, and the science of the nation: lists of kings, accounts of their achievements in peace and war, laws regulating the domestic relations, chronological and astronomical tables, lists of plants and animals, private contracts in regard to land, slaves, and the sale and exchange of property of all kinds; in fact, something in regard to almost every subject which can arouse our interest or excite our curiosity. Copies of vast numbers of them have been published, particularly by the British museum, under the superintendence of Rawlinson; and many have been published with commentaries and translations by Oppert, Menant, and others. In the palace of Asshurnasirpal, king of Assyria about 900 B. C, in the city of Calali, the modern Nimrud, a large number of mural slabs were found by Layard, upon all of which was the same inscription in Assyrian cuneiform characters. Some of these slabs are now preserved in the libraries of several colleges in the United States. The "Dickinson Nineveh Gallery " of Amherst college contains some of them, which were procured for the college by the Rev. Henry Lobdell. Photographs of the inscription on one of these slabs, accompanied by an original transliteration in Roman letters and an original literal translation into English, by the Rev. W. H. "Ward, a graduate of the college, were presented by him as a jubilee offering to the college on the occasion of its semi-centennial anniversary in 1871. The photographs and manuscript are now in the college. The inscription recounts, in the usual style of oriental exaggeration, the military achievements of the king and the building of his palace. This is probably the first translation of an Assyrian inscription made by an American scholar. - One of the most interesting contributions to the literature of this subject was made by Mr. George Smith, of the British museum, in 1871. It consists of the cuneiform text of all the historical inscriptions in the British museum relating to Asshurbanipal, king of Assyria about the middle of the 7th century B. C. The principal inscription is upon a ten-sided prism, and contains over 1,200 lines of cuneiform writing. Mr. Smith gives an interlinear English translation and commentaries. In this inscription are mentioned the conquest of Egypt by Esarhaddon, the father of Asshurbanipal, and the principal events of the reign of the latter. We also learn from it the Assyrian account of the kings of Egypt Tirhakah, Necho I., and Psammetichus I., the Lydian kings Gyges and Ardys, the conquest of Babylonia, Susiana, and Arabia, and various other matters treated by the Greek historians. One of the most recent and in many respects most curious additions to our knowledge has also been made by Mr. Smith. In December, 1872, he read before the Biblical archaeological society in London a paper describing a series of inscriptions upon tablets, originally at least twelve in number, and consisting entirely of legends relating to the deluge. Of these tablets some are missing, some are so broken and mutilated as to be unintelligible, and all are more or less injured. But the eleventh tablet, which gives the details of the story of the deluge, is the best preserved, and it contains nearly 300 lines of cuneiform writing. Mr. Smith gives an English translation of its contents. In the general features of its account of the deluge it agrees with that in Scripture. A great flood was sent upon the earth to punish men for their wickedness. 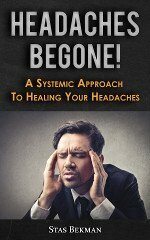 One man, Sisit (the Xisuthrus of the Greeks), receives a divine warning and a command to build a huge ship, and to take into it a chosen few only of mankind, together with some of all other living things. The flood came, then subsided; the ship grounded upon a mountain; birds were sent out and returned twice, but the third time returned no more. Then Sisit went forth, built an altar, and made a sacrifice. Transliteration And Translation Of A Portion Of An Assyrian Decagon In The British Museum - A, Col. Iv., Lines 48-50. * Determinative sign used where the name of a god is to follow. † Determinative wedge used where the name of a person is to follow. 1. 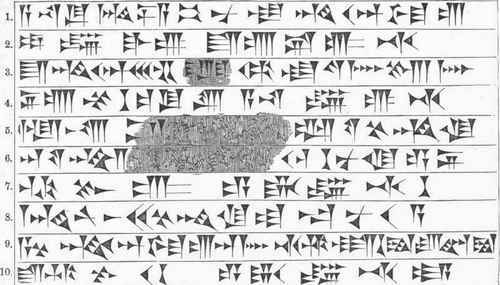 I am Asshurbanipal, descendant of Asshur and Beltis. 5. and in the body (of his mother was made to) rule Assyria. 7. commanded the establishment of his kingdom. 9. the will of Asshur and Beltis, the gods his protectors, fulfilled, 10. who commanded him to form my kingdom. * Supposed to have been the name of the harem of the palace of Nineveh. 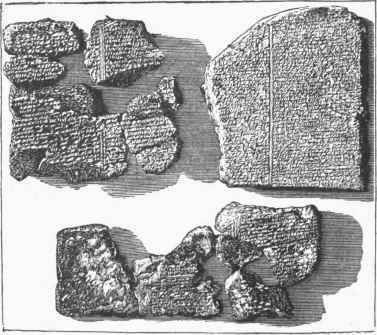 Fragments of a Tablet from which the Account of the Deluge was deciphered. Such are the main points in which the inscription agrees with the Mosaic writings; but in almost all the details, where there is precision in the statements, the accounts differ, and the inscription contains a mass of mythological and other fables, showing it to have been the production of an exceedingly superstitious people. In this, as in many other Assyrian inscriptions, while a consistent meaning can be made out, yet there is some doubt as to the words represented by the characters and some uncertainty as to the general result. Even Mr. Smith does not pretend to give the proper names with exactness. However, Sir Henry Rawlinson, who presided at the meeting before which Mr. Smith's paper was read, vouched for the accuracy of the translation, and ascribed to the legend which the inscription records an antiquity of 6,000 to 7,000 years B. C. But amid all that is doubtful, scholars are so far agreed on the interpretation of these inscriptions that we may expect important additions from this source to our knowledge of the ancient world. Thousands of inscriptions yet remain buried among the ruins of Assyria; and when they are exhumed and subjected to the searching criticism of modern scholars, Assyrian, like classical philology, may come to be regarded as a distinct, extensive, and important department of learning. - The literature of the subject of cuneiform inscriptions is already very extensive, and is rapidly increasing. The following works are perhaps the most useful, and contain abundant references to other sources of information: Fr. Spiegel, Die Altpersischen Keilinscliriften (Leipsic, 1862); Menant, Expose des elements de la grammaire assyrienne (Paris, 1868); Oppert, Elements de la grammaire assyrienne (2d ed., Paris, 1868); F. Hitzig, Sprache und Sprachen Assyriens (Leipsic, 1871); Ewald, Gescliiclit-liche Folge der semitisclien Sprachen (Gottin-gen, 1871); Schrader, Die Keilinscliriften und das Alte Testament (with, chronological appendices and a glossary, Giessen, 1872), and Die Assyrisch-Baoylonischen Keilinscliriften (Leipsic, 1872); Rawlinson and Norris, "The Cuneiform Inscriptions of Western Asia" (3 vols., 1861-70, lithographed for the British museum); George Smith, "History of Assurbanipal," cuneiform texts with translation (London, 1871), and "Phonetic Values of Cuneiform Characters" (1871); A. II. Sayce, "An Assyrian Grammar" (London, 1872); and Norris, "Assyrian Dictionary " (vols, i.-iii., London, 1868-'7l).